Absolute gem of a place to stay. Anne is the perfect host, lots of information to help us get around he city, Great location for public transport, local places to eat and drink at reasonable prices and quieter than in the city. Fabulous tapas and Thai that we tried, lovely pub with food down the road a short walk which we didn’t get to try but recommended by Anne. Lovely homely feel, comfy beds, hot showers, fluffy towels, really cozy feeel to the place. Great breakfast too making for a wonderful start to the day. Will definitely stay here again when next in Dublin. I stayed at Applewood b&b recently. It was a very pleasant stay. Ann is a very nice woman and a great host. The house is lovely, old-style suburban Dublin house, bed was comfortable and bathroom immaculate. Breakfast was simple but tasty. Just across the road from the 16 bus stop to the airport and bus to city centre outside the door. Both journeys only 10mns. Very fair price for Dublin b&b - i would definitely recommend and will certainly stay at Applewood again, if I can. So glad I did a very good choice! Great host, great accommodation, clean and strategically located between the airport and city centre. The host gave us great tips. Highly recommended! We only stayed one night but it was a very pleasant stay. The room was luxurious, clean and very comfortable. Thank you very much! Sehr zum empfehlen, Bus in die Stadt gleich in der nähe. Vom Flughafen aus, leicht erreichbar. Nette Gastgeber, sehr sauber. Perfect location for the conference I was attending. Friendly reception and en-suite room very satisfactory. Splendid "continental" breakfast. Anne gave good advice about local restaurants. Definitely to be recommended. Perfect. two nights. nice room. very nice reception. Very good breakfast. Near city center. Closed to bus stop. 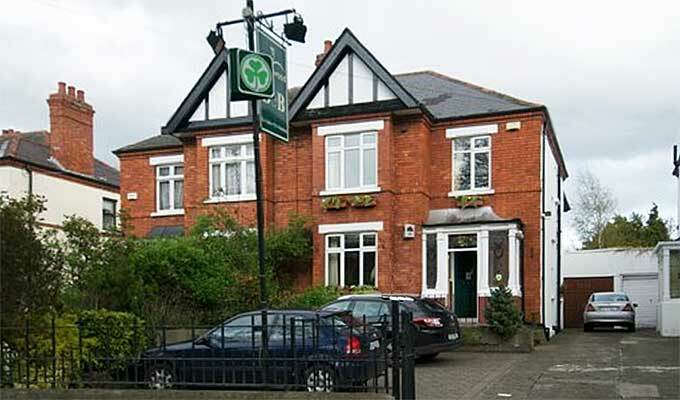 Very well located in the bus route between Dublin City Centre and Dublin Airport. Our host , Anne , was extremely welcoming and a treasure trove of information . The breakfast was wonderful and cooked to order . There are a number of restaurants in the area for lunch or dinner . Our room was very comfortable and even though it was on a busy road , we were not disturbed at all by traffic . Highly recommended . my sister and I stayed for 4 nights. Anne offered very helpful suggestions for getting around Dublin. Our room was very clean and bright. the house is located right on many bus lines into the city centre. I highly recommend this lovely home for your stay in Dublin. Excellent welcome, well located but a bit noisy for the rooms near the road.Excellent food and Ann was very helpful. Anne is a charming landlady, very friendly and very helpful. She sees to everything and does her best to make your stay at Applewood as comfortable as possible. Breakfast is freshly made and always delicious. Applewood is a nice, cosy place, clean and tidy. All these make you want to come there again. A very friendly and clean hostel with a delicous breakfast and really nice rooms for a very good price. It is located on the direct way from the airport to the city with some shops, restaurants and bars around. It takes about 30 min walk to the spire. Excellent and faultless B and B. Anne is a fantastic host who is very approachable, friendly and ensures that her customers our happy with the services provided. A very nice clean house , with easy accessibility and very good options of continental or Irish breakfast. I intend to stay here again in the future. Very good choice of stay for professionals. Lovely and very helpful owner, very clean rooms. The breakfast was lovely,too. I would definetely recommend the accomodation to friends! First of all, Mrs Smith, the owner of the B&B, is a very nice and helpful lady. Very comfortable and clean room and very good breakfast. I certainly would like to stay again at this B&B. It was really a very nice & comfortable place, & Ann was very kind & a gracious person, I highly recommend Applewood, B&B This was our 2nd time return!! Very lovely B&B a bit outside of Dublin city. Bus connections to the city centre and Dublin airport running frequently, bus stop just in front of the house. We got the familiy room which decoration I liked very much. There was also plenty of room for us being only 2 people :- Ann was very helpful with information & directions. So short conclusion: I would definitely go there again! Had a great stay at Applewood & would definitely make a beeline for there again. Anne made a special effort to call & ensure I was happy as the only room left available was small - as such I expected to have to climb over my partner to get into bed. No such thing, the room was beautiful so if it was the smallest I can only imagine how nice the other are. The breakfast was fab and Anne was very helpful with directions & information. If this is the area you want you cannot go wrong. -Oh and a nice little catchment of restaurants & pubs in walking distance.